and just like that it’s fall again. the weather’s becoming chilly and the school work is piling up. (at least for christine, not for me XD) so what else can you do but cook something warm and put off those psets! to start, i made more hearty stew. this is still basically take what you have the the freezer, chop it up and put it in water to boil. 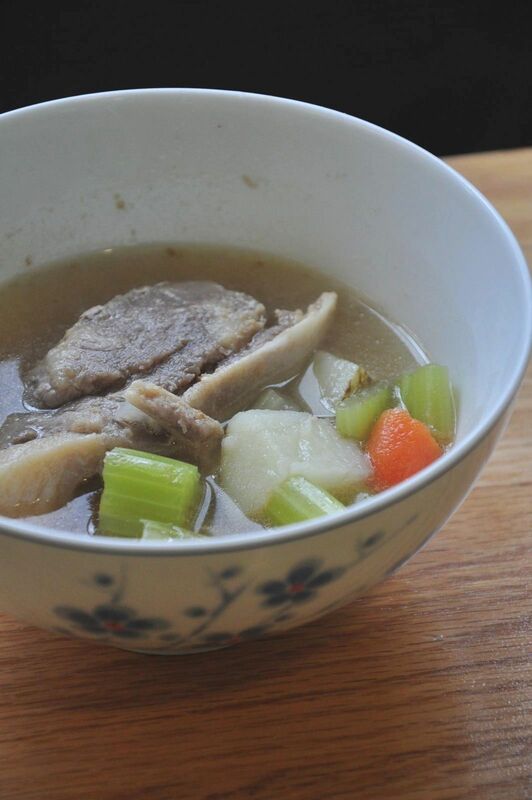 and with the drop in temperature, having a nice rich brothy stew to drink is wonderful. Start 6 cups of water to heat in a wok or pot. Place lid on for faster heating. When water starts to boil, put in the meat. Make sure you have enough water to cover the meat. Toss in bay leaves and reduce to a simmer. Cut potato, celery, and carrots to bite size chunks. After meat has been in the water for 3 minutes, toss in the vegetables. Also add in the salt, pepper, paprika, and garlic powder to taste. Let the stew simmer for 20 minutes, occasionally stirring and flipping the meat. When carrots are tender, the soup is ready to serve. Wow, I realized that the directions really didn’t teach you anything. Mostly, it’s me with a pot of water, leftovers from the fridge, and a collection of spices. I think experimentation is important, and as long as you don’t add too much of anything, a meat stew will always come out smelling and tasting great. For christine, we also made a veggie stew and appetizer. Since she’s competing at the MIT tournament in a week. we kept it low calorie by using a lot of tofu and veggies. Slice the tofu into small, thin slices. Arrange the slices onto a plate for serving. 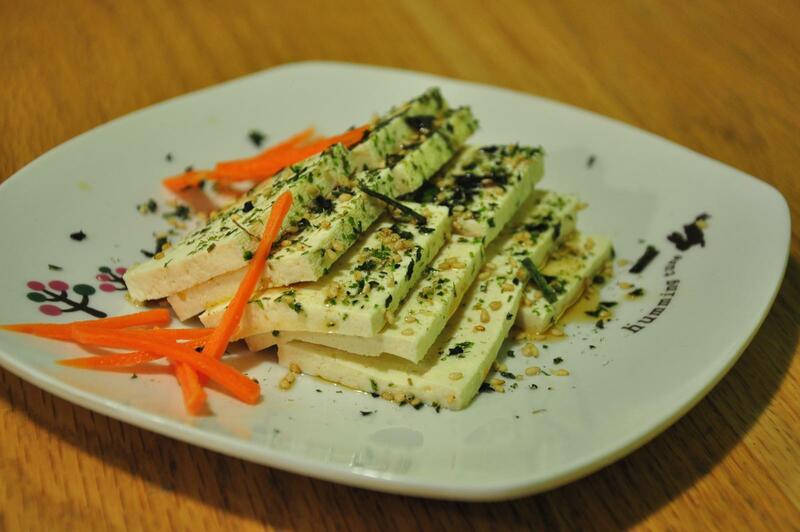 Drizzle sesame oil lightly over the tofu, then sprinkle furikake generously. Bring water to a simmer in a pot. White water is heating up, slice carrots and celery heart into small chunks. Toss the vegetables into the water and let cook until celery is soft. 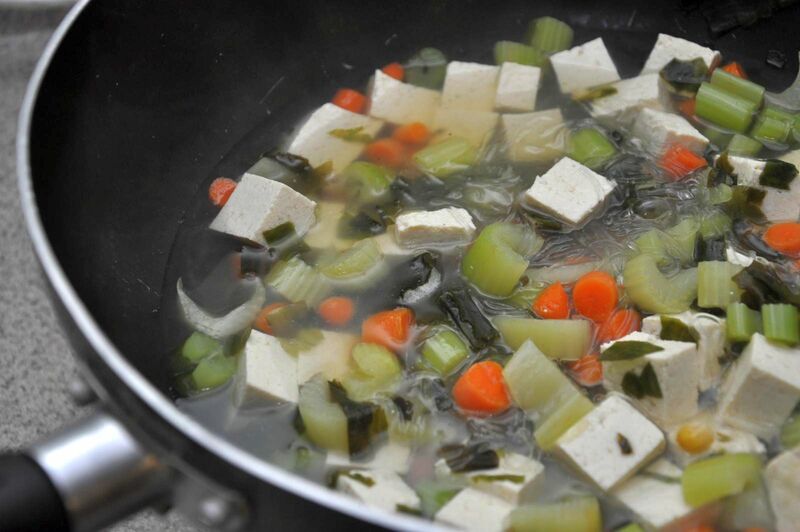 Cut tofu into small cubes. Add in seaweed seasoning. (Seasoning can be made just from 1 sheet of sushi seaweed and 1 shitake mushroom, diced.) Add in the tofu cubes, and flavor with salt and pepper to taste. Add in the noodles, and let the soup simmer until the noodles are the desired softness. Ways to prolong procrastination: sit and enjoy the soup! The weekend before last, I took a short trip back home to California for my dad’s birthday. Usually when I’m home, my mom doesn’t ever let me touch the stove because, in her words, she doesn’t like eating food made by people who don’t know how to cook. Ouch…burn. To be fair, my mom is the best cook in the entire world. 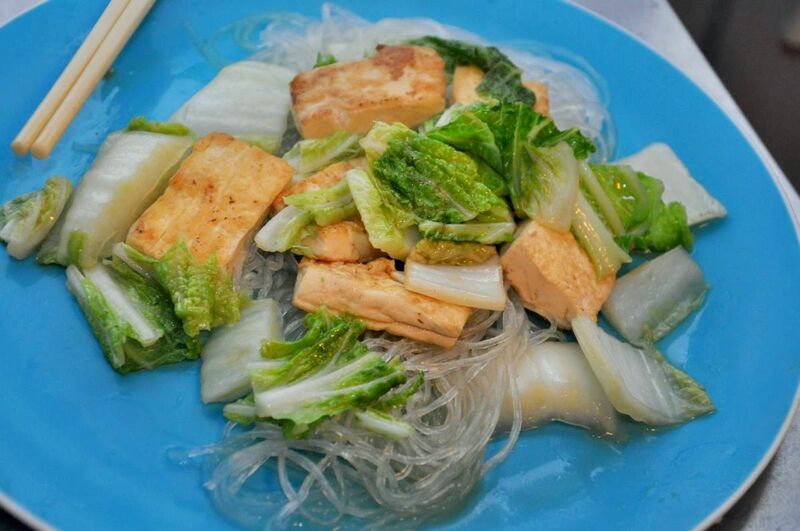 This tofu, napa cabbage, and vermicelli dish is one that she taught me that weekend. And because she was swamped with cooking a banquet-sized dinner, she actually let me pan-fry the tofu! (Under her careful supervision, of course.) Progress is being made. 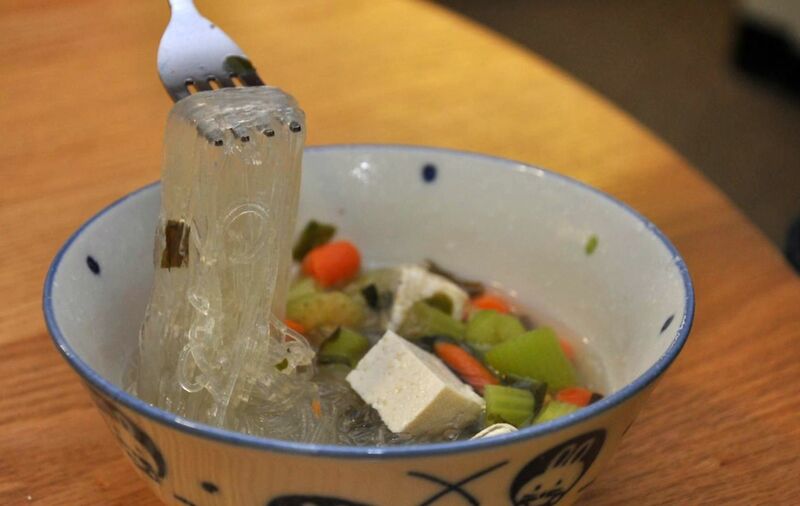 Put vermicelli in a bowl of cold water to soak. 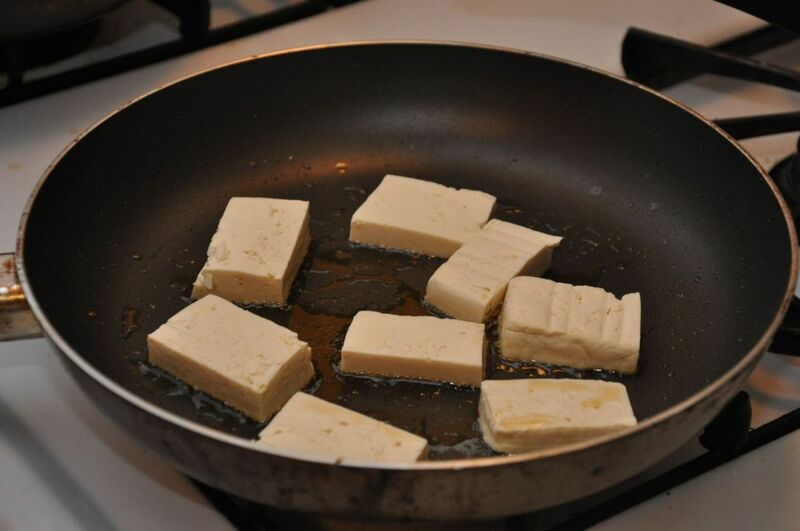 Cut tofu into small, flat blocks, about 1/2″x2″x3″, and lightly pan-fry with sesame oil. Set aside. Slice the napa cabbage and stir-fry for 5-10 minutes. They should still be crunchy and undercooked. Add in the tofu along with about 1/2 cup of the water the vermicelli has been soaking in and cover. While you wait, remove the vermicelli from the water and cut into 6″ strands. This step is skippable if you don’t mind long strands of vermicelli or if, like me, you just forget. Add in the vermicelli when the napa is almost cooked through. It’s important not to add the noodles in too early because they’ll turn into mush if cooked for too long. Season to taste. I usually use soy sauce, salt, white pepper, and some Asian “vegetarian seasoning” from home. The thing is like MSG–it makes everything taste like magic–but has to be all-natural because I bought it at an organic/health food store. But I digress. If you prefer your sauce to be a little thicker, feel free to add in some corn starch or flour. When your napa is soft, it’s all done! Nom to your heart’s content. Or until it’s all gone. Ways to prolong procrastination: Cook some rice to go with it!